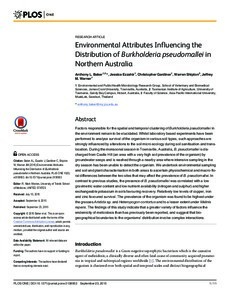 Factors responsible for the spatial and temporal clustering of Burkholderia pseudomallei in the environment remain to be elucidated. Whilst laboratory based experiments have been performed to analyse survival of the organism in various soil types, such approaches are strongly influenced by alterations to the soil micro ecology during soil sanitisation and translocation. During the monsoonal season in Townsville, Australia, B. pseudomallei is discharged from Castle Hill (an area with a very high soil prevalence of the organism) by groundwater seeps and is washed through a nearby area where intensive sampling in the dry season has been unable to detect the organism. We undertook environmental sampling and soil and plant characterisation in both areas to ascertain physiochemical and macro-floral differences between the two sites that may affect the prevalence of B. pseudomallei. In contrast to previous studies, the presence of B. pseudomallei was correlated with a low gravimetric water content and low nutrient availability (nitrogen and sulphur) and higher exchangeable potassium in soils favouring recovery. Relatively low levels of copper, iron and zinc favoured survival. The prevalence of the organism was found to be highest under the grasses Aristida sp. and Heteropogon contortus and to a lesser extent under Melinis repens. The findings of this study indicate that a greater variety of factors influence the endemicity of melioidosis than has previously been reported, and suggest that biogeographical boundaries to the organisms’ distribution involve complex interactions.